Considerable cloudiness. Occasional rain showers in the afternoon. High 64F. Winds light and variable. Chance of rain 60%.. Rain likely. Low 54F. Winds light and variable. Chance of rain 70%. Rainfall near a quarter of an inch. 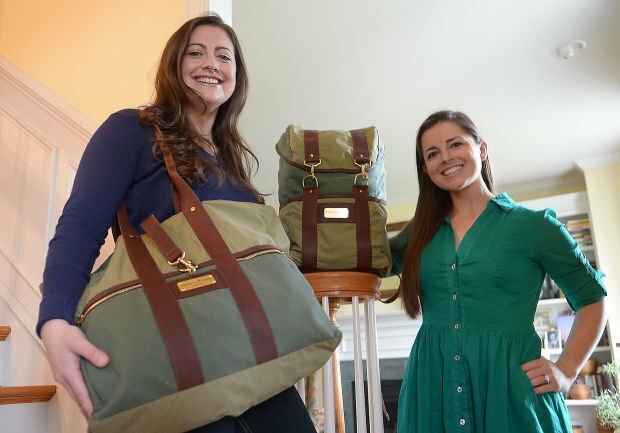 Betsy Nunez, 25, left, and her sister Emily Nunez, 23, have started a kickstarter campaign to help them raise money for their military fabric reuse line of bags. 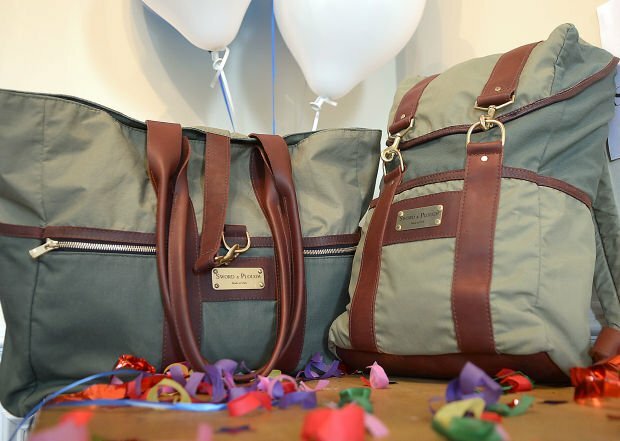 Betsy Nune and her sister Emily Nunez have started a kickstarter campaign to help them raise money for their military fabric reuse line of bags. Two former Carlisle residents hope a Kickstarter fundraising campaign that started Monday will continue their business’ growth and love for veterans. Betsy and Emily Nunez are the children of retired U.S. Army colonel Joseph Nunez, who moved from West Point to the U.S. Army War College in Carlisle in 1998. Though the two now live outside Central Pennsylvania, but returned home this past weekend as the start of their Kickstarter campaign began. The Nunez sisters run Sword & Plough — a business they call a quadruple bottom line company because of the four founding ideas that motivated the project: it find its inspiration in the people who work for the betterment of the country and who support its mission; its purpose comes back to strengthening civilian-military relations; it practices sustainable production to better the planet; and it has registered itself as a Limited Liability Company (LLC) with the goal of making a profit. While, like any company, they look to make a profit with their wares, the Nunez sisters also want to make sure they’re making a difference for veterans. Ten percent of all profits will be split between two veteran organizations — Veteran Green Jobs and the Wounded Warrior Project — and the company relies on veteran employment for its products. Sword & Plough comes from the biblical expression “to beat swords into ploughshares,” and metaphorically, this is exactly what the sisters are doing. They take surplus military supplies and turn them into products. “I wanted to create something that would emotionally and physically touch civilians in their everyday lives and remind them, in a beautiful way, of the challenges our country and servicemen face,” Emily Nunez said. The idea started back when the two sisters were still studying. After speaking to soldiers returning from war, Emily Nunez went back to Middlebury College in Vermont, and the ROTC student came up with an idea to use military surplus material to make a sustainable product that could benefit and employ veterans. Working with Middlebury’s Center for Social Entrepreneurship, Emily was able to cultivate her idea into a formal business plan. Betsy Nunez, an alumna of West Chester University, was by her side the whole time. The product’s life cycle starts with the collection of military surplus material. The fabrics are accentuated with local leather products, and turned into stylish designs. Manufacturers who employ veterans then produce the bags and accessories, which are sold to the public. Eventually, the sisters hope to open their own factory that would employ strictly veterans. With Middlebury’s help, Emily Nunez introduced her plan to Dell Social Innovation Challenge, where it made it as a semi-finalist in the competition. While presenting with the program last summer, the sisters kept hearing that they needed a tangible product. In what Betsy described as one of many desperate phone calls made to their mother, Judy, throughout the process, they called home to Carlisle and asked their mom if she could throw something together using the surplus tent they had at home. “We weren’t with her but she was running around inside and outside of the Carlisle area to get materials and to get advice and put together the first bag,” Betsy said. From there, the project was entered into the Harvard Pitch for Change Competition, where it won first place — a check for $6,500 and free business consulting. It was also presented on the floor of the New York Stock Exchange during the Kairos Global Summit. In recent months, the business continued to take off, and the sisters started a 30-day Kickstarter fundraising campaign Monday, where their products can be pre-ordered. The sisters have been dreaming up plans of starting a business together for as long as they can remember, and are thrilled to finally be working as productive partners. Their team has grown to include Communications Director Haik Kavookjan, financial Officer John Thorpe, designers Evan Daniels and Abraham Bendheim, and Graphic Designer Annie Ulrich. They also have a board of directors, which includes CEOs and entrepreneurs from companies and organizations across the globe, including their father, who is recently returned from Iraq and currently works as a senior energy and commercial development officer for the state department. Despite the fact that Emily Nunez, an active duty military officer, is soon leaving for Afghanistan, she plans to maintain her role as CEO of Sword & Plough. Betsy Nunez is the only full-time employee of the business, and she will hold down the fort in the states while her sister is gone. Betsy Nunez describes herself as now playing four roles for her recently engaged sister. “I’m her best friend, her sister, her business partner, and now her maid of honor,” Betsy said. The only one of the three Núñez children to not participate in ROTC or plan to the enter the military, Betsy Nunez has found her military niche through this project. “This is my way of making my mark and having an impact,” she said. The products, which include a rucksack, a tote bag, a messenger bag, an iPhone case, an iPad cover, a leather key-chain and T-shirts range in price from $35 to $289, and can be pre-ordered for a discounted price on the company’s Kickstarter page, at www.kickstarter.com/projects/swordandplough/sword-and-plough. You can also shop online at www.swordandplough.com or follow the sisters’ business on Facebook at www.facebook.com/swordandplough and on Twitter @swordnplough.